Blue Moon for ViZion™ + DR | Konica Minolta Healthcare Americas, Inc. The Blue Moon Drop Plus Lifecycle Solution is designed to minimize downtime, maximize productivity, and eliminate risk throughout the lifetime of your ViZion™ + DR System. 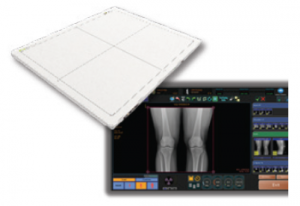 Konica Minolta is an industry leader with the most reliable Digital Radiography solutions available today. Our high customer satisfaction rating is based on supporting you throughout the entire lifecycle of your system, not just when it breaks. Enjoy peace of mind with dependable technical assistance around the clock. Get answers to all questions and challenges from “how-to” support to remote diagnostics and troubleshooting. Quicker problem diagnosis and resolution means less unplanned downtime, leading to better patient care and uninterrupted performance. Benefit from the latest and greatest software version, helping ensure that all new productivity enhancements are available. When combined with follow-up applications training, users will remain well equipped to deliver patient exams with clinical confidence and efficiency. With Blue Moon Drop Plus, the most expensive components are covered against unexpected failure, eliminating high-cost surprises. Software updates, remote training, and technical support costs are also included in this one simple plan. Blue Moon Drop Plus goes beyond typical warranty services, such as parts and labor, by providing additional ongoing support elements, from major component protection (drop) to on-demand remote support. Whether used in an enclosure or not, the DR panel is covered. 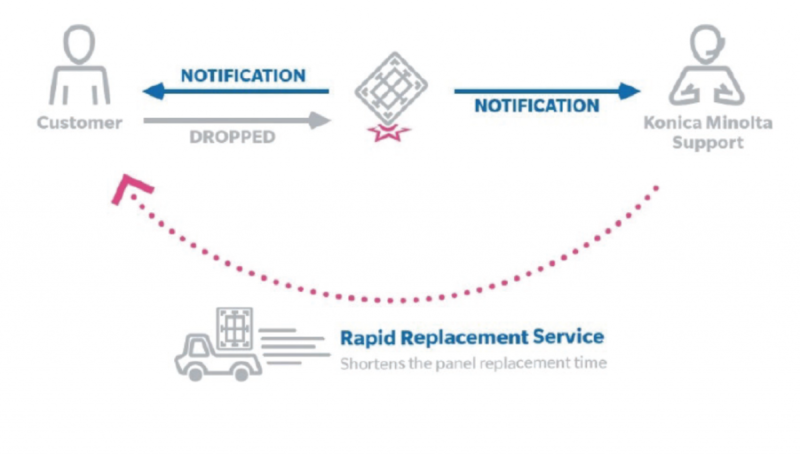 Should the DR panel stop working, it will be repaired or replaced – a replacement panel will be delivered immediately with available next day service. With each accidental drop or bump event, a fixed copay applies. Panel damage due to liquid invasion is not covered. maximize workflow efficiency and diagnostic capabilities. When available, software updates are administered remotely or during on-site visits. configuration changes, screen control within the software This benefit provides remote assistance when IP addresses or other configuration setting changes are needed. Get simple access to assistance to make a change exactly when it is needed. Remote screen control is used in order to better demonstrate system operation to users. On-site support from qualified service engineers to diagnose difficult problems or perform scheduled preventive maintenance. When a problem cannot be solved remotely, on-site coverage continues the support process to get the system working again. Trained engineers take over the troubleshooting so users can get back to patient care. 24/7 phone support to assist with any operational support or performance issue. Whether the day or evening shift, customers can get the dependable assistance they need with just a phone call. Phone support is the first step in problem resolution. Most of the time, a phone call is all that is needed to resolve the issue. Normal wear and tear parts exchange/replacement. Provides quick access to replacement parts when an unexpected problem occurs, minimizing downtime. Consumables, such as batteries, are not covered. Note: Actual services and components covered depend on the specific terms of the agreement. Blue Moon Drop Plus for ViZion + DR is offered in multiple purchase options to create the right choices to meet each customer’s financial considerations.